We would like to introduce you to a unique way for you and your child to learn a foreign language together. You may already be bilingual yourself, have family abroad, remember your school-French or have no previous experience in speaking another language, everyone is welcome. The Petits Poussins Method gives you the opportunity and opens the door to a hands-on experience on how to raise your child in a bilingual environment. Advice is always at hand to give you tips on how to reinforce, if you choose, what you and your child have learned during our fun sessions. It’s all about repetition! The ethos at Petits Poussins is to expose as many children, from as young an age as possible, to learning French in a fun and positive manner. Our children deserve to have the gift of bilingualism, something that is done so well and is a standard in so many other European countries. Your child will leave the first session having either, spoken, gestured a response, shown understanding of the spoken language, go home and repeat something they have heard at a random moment or when you ask them something, or all of the above! Sessions are fun and interactive and we only ever speak in the foreign language, which gives you and your child 100% exposure. Learning is done entirely through play using songs, puppets, plenty of visual stimuli, songs, finger rhymes movement, crafts, stories and much more.. Younger siblings are always welcome and a sibling discount is offered. Many of our pre-schoolers have been coming to Petits Poussins since they were the ‘younger sibling’, a babe in arms. They have had many years’ exposure to hearing, understanding and responding to French, as all of our sessions are only ever delivered in the target language. 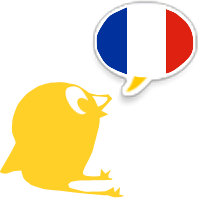 Some of our Petits Poussins’ first words have been in French, even though their parents are English speakers! What an honour it has been to witness this! Our prices are very reasonable and provide great value for money. We aim to share our gift of bilingualism and provide you with top quality language learning experience! We are working to add new languages all the time. IF YOU ARE INTERESTED IN TEACHING WITH US, or would like us to provide a particular language, please contact us.